Over the past few decades, great work by physicists and philosophers has cleared up much of the early confusion about the foundations of quantum mechanics. Controversies are still ongoing and old prejudices are hard to overcome, but the measurement problem and its possible solutions, the importance of non-locality, the status of probabilities, etc. are now well understood at least by experts. Time to look forward. 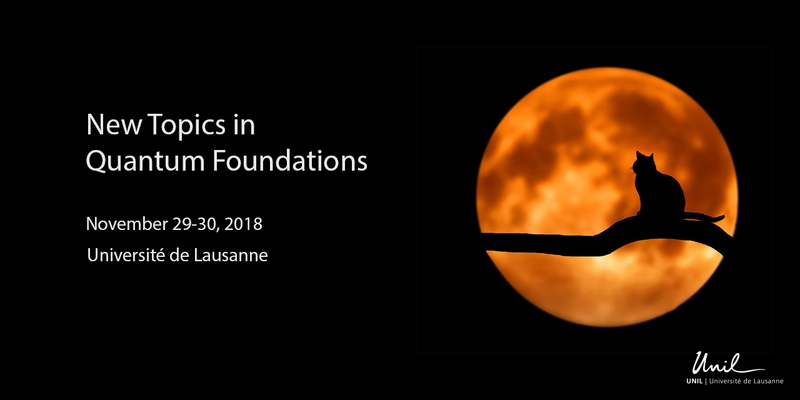 In this two-day workshop, young researchers from Switzerland and abroad are going to present new research topics in the foundations and metaphysics of quantum physics. Monism is roughly the view that there is only one fundamental entity. One of the most powerful argument in its favour comes from Quantum Mechanics. Extant discussions of quantum monism are framed independently of any interpretation of the quantum theory. In contrast, this paper argues that matters of interpretation play a crucial role when assessing the viability of monism in the quantum realm. I consider four different interpretations: Modal Interpretations, Bohmian Mechanics, Many Worlds Interpretations, and Wavefunction Realism. In particular, I extensively argue for the following claim: several interpretations of QM do not support monism at a more serious scrutiny, or do so only with further problematic assumptions, or even support different versions of it. 14h45-15h45 Matthias Egg (Bern): How Scientific Can a Metaphysics of Quantum Mechanics Be? Ongoing disagreement about the measurement problem in quantum mechanics is a major obstacle for the project of scientific metaphysics, because there do not seem to be any universally accepted scientific standards that would let us decide what the true metaphysics of quantum mechanics is. One response by scientific metaphysicians has been the attempt to dissolve (rather than to solve) the measurement problem. After discussing one particular proposal in that spirit (due to Ladyman and Ross), I will explore the prospects of such an approach in general. The tentative lesson to be drawn seems to be the following: the more narrowly „scientific“ one’s approach to the measurement problem is, the more it is in conflict with the kind of scientific realism that is usually presupposed by the very project of scientific metaphysics. In “The wave-function as a multi-field” (EJPS 2018, with Mario Hubert), we have showed that the wave function in the de Broglie-Bohm theory can be interpreted as a (new kind of) physical field, i.e. a multi-field, in three dimensional space. In this talk, I argue that the natural framework for the multi-field view is the original second order Bohm’s theory. In this context, it is possible to construct the multi-field as a real scalar field, to explain which sort of physical interaction is at work between the multi-field and the Bohmian particles and, finally, to clarify some philosophical aspects about the dynamics of the theory. At the moment, one of the most worked out programs to quantize the general relativistic gravitational field is the so-called “canonical approach”. However, the theories falling in the scope of the canonical program (most notably, loop quantum gravity) have to face at least three huge conceptual issues. The first is that canonical quantum-gravitational states “betray” the spirit of relativity in that they represent purely spatial, as opposed to spatiotemporal, physical degrees of freedom. The second is that the equation that describes the dynamical evolution of these states –the Wheeler-DeWitt equation– does not involve any time-like parameter, thus seemingly cutting off temporal evolution from the physical picture. The third is that quantum-gravitational states are obviously subjected to superpositions and entanglement, which makes very difficult to explain how stable classical spatiotemporal structures can emerge from the quantum regime. In this talk, I will propose a philosophical framework based on the notion of “self-subsisting” structure, which might help physicists working in the canonical program to move in the direction of ontological clarity. This framework combines (i) a primitive ontology approach to quantum physics, (ii) ontic structural realism, and (iii) a non-standard treatment of dependence relations. Moreover, I will point out how the dynamics of self-subsisting structures can be naturally implemented using shape space physics, which is a theoretical framework for constructing purely relational theories, originally developed by Julian Barbour. What are nomological entities? According to Quantum Super-Humeanism (Esfeld 2014, 2018), only matter points and their distance relations exist, while the wave-function and all the dynamical parameters of quantum mechanics should be considered nomological. If this is true, then it is certainly important to achieve a metaphysically rigorous understanding of what the term ‘nomological’ amounts to. In the first part of my talk, after exploring different accounts given to nomological entities within and outside Humeanism, I will raise some metaphysical worries that these accounts have to face. I will dedicate the second part of my talk to what I consider to be a very interesting case of nomological entities: the case of spin-networks in loop quantum gravity. The emergence of spacetime from quantum gravity appears to be a striking case-study of emergent phenomena in physics (albeit one that is speculative at present). There are, in fact, two different cases of emergent spacetime in quantum gravity: a “synchronic” conception, applying between different levels of description, and a “diachronic” conception, from the universe “before” and after the “big bang” in quantum cosmology. The purpose of this paper is to explore these two different senses of spacetime emergence; and to see whether, and how, they can be understood in the context of specific extant accounts of emergence in physics. Spontaneous collapse models models and Bohmian mechanics are two different solutions to the measurement problem plaguing quantum mechanics. Apart from having a clear primitive ontology, they have a priori nothing in common. At a formal level, collapse models add a non-linear noise term to the Schrödinger equation, and extract the primitive ontology either from the wave function (mass density ontology) or the noise itself (flash ontology). Bohmian mechanics keeps the Schrödinger equation intact but uses the wave function to guide particles, which then make up the primitive ontology. Collapse models modify the predictions, whilst Bohmian mechanics keeps the empirical content intact. However, it turns out that collapse models and their primitive ontology can be exactly recast as Bohmian theories. More precisely, the stochastic wave-function of a collapse model is exactly the Bohmian wave function of the system considered coupled to a carefully tailored bath upon conditioning on the bath Bohmian positions. The noise driving the collapse model is a linear functional of the Bohmian positions. The randomness that seems progressively revealed in the collapse models lies entirely in the initial conditions in the Bohmian theory. The construction of the appropriate bath is not trivial and exploits an old result from the theory of open quantum systems. This reformulation of collapse models as Bohmian theories brings the question of whether there exists realist reconstructions of quantum theory that cannot ultimately be rewritten this way, with some guiding law. The workshop takes place at UNIL-Anthropole, Quartier Dorigny, 1015 Lausanne. Thursday: Room 5060. Friday: Room 4021. On the highway, drive in direction “Lausanne-Sud”, take the exit “UNIL-EPFL”. Follow the direction “UNIL” and then “UNIL-Chamberonne”. If you need help booking an accommodation in Lausanne, please contact the organizers.